This is such a beautiful dessert, perfect for an impressive holiday or entertaining menu but also simple enough to prepare on a weeknight for your family dinner. The sweet and slightly tart jam tastes absolutely perfect with the tender and fluffy frosting. The cake itself is so delicate. 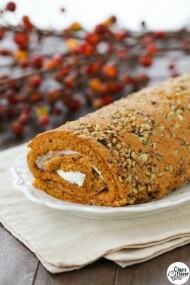 I found this recipe in a Martha Stewart Holiday magazine and made a few minor adjustments. My family absolutely loves it. Preheat the oven to 400 degrees. 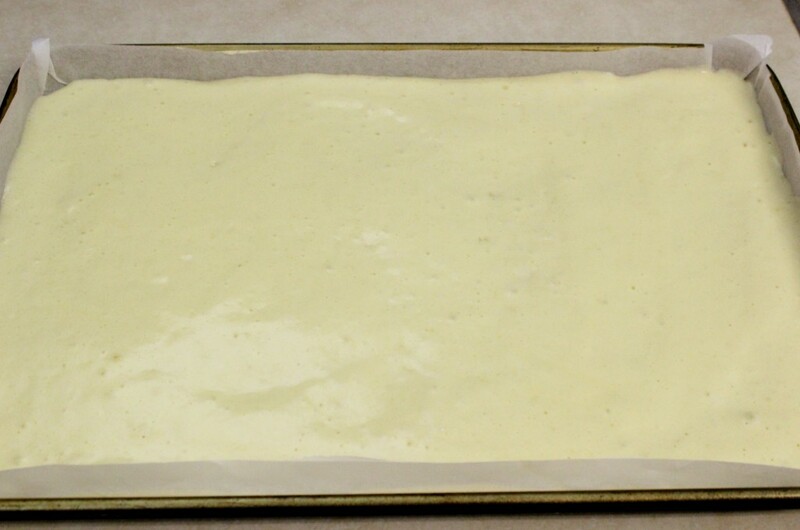 Line a 15×17 in baking sheet with parchment paper and spray with baking spray. 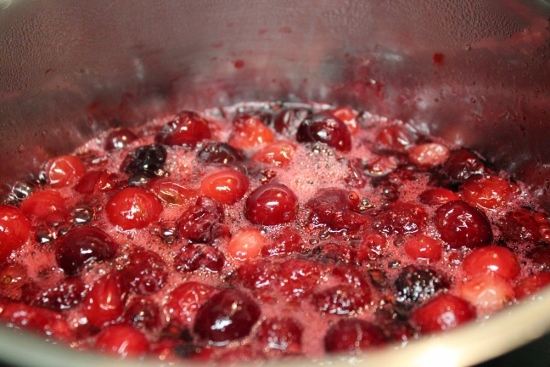 In a small sauce pan, combine the berries with the sugar. 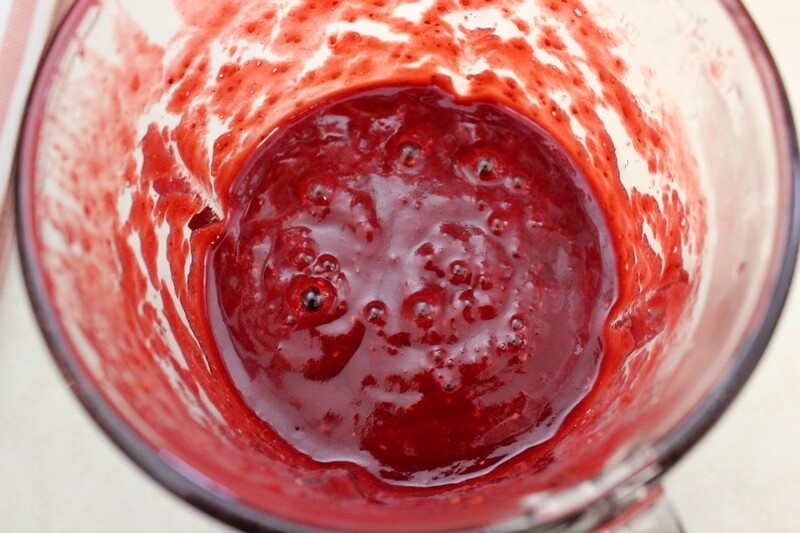 (You can also make the jam from one of the berries, just use 8 oz of either of them). Cover and allow to cook on medium heat until the sugar melts. Bring to a boil. This will take longer if the berries are frozen. Turn down the heat and keep the berries simmering. Here’s a jam that I made with strawberries and raspberries. Cook for 10-15 min. Mash with a potato masher or combine in a food processor/blender. 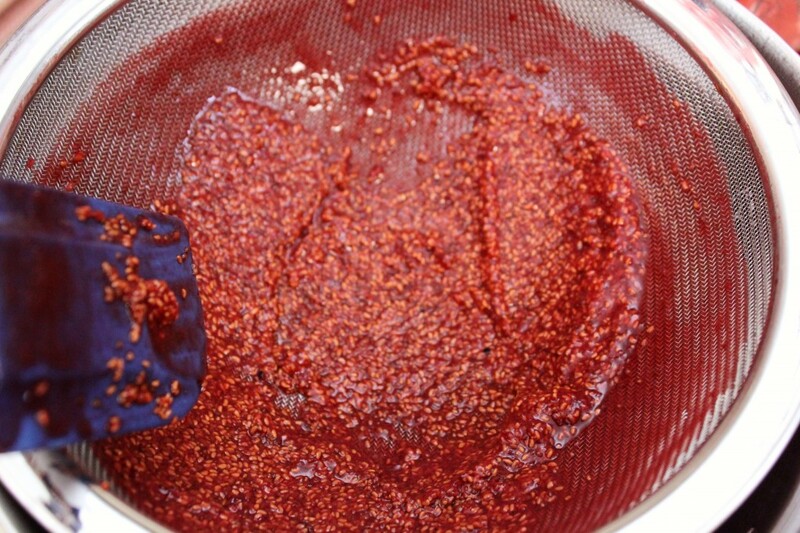 Strain the cooked berries through a fine mesh sieve to get a smooth jam. I really would prefer to keep these out of my teeth! Set aside to cool. Combine the eggs and sugar in a heatproof bowl. 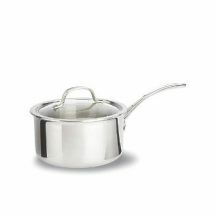 Place over a pot with about 1-2 inches of boiling water. Whisk until the sugar dissolves and the eggs are slightly warm. 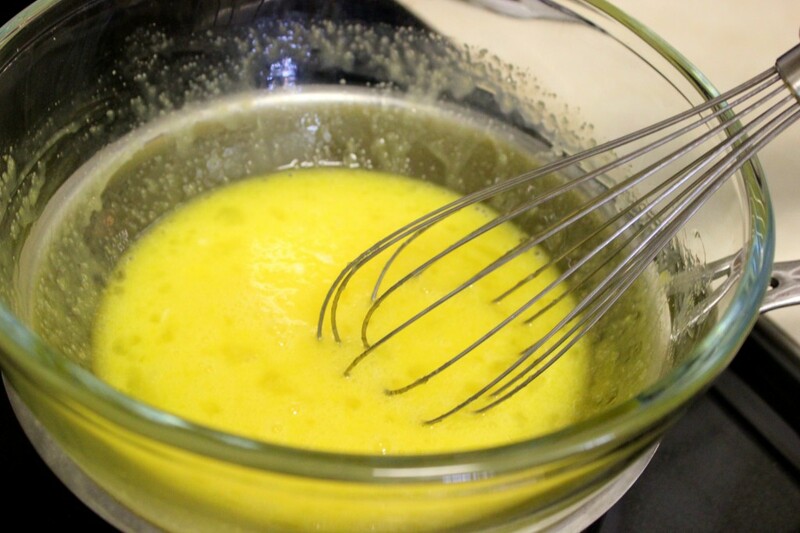 Place in a large bowl and mix with a whisk attachment for about 6 min, or until the eggs are light yellow and fluffy. Sift in the flour and salt and gently fold in with a rubber spatula. 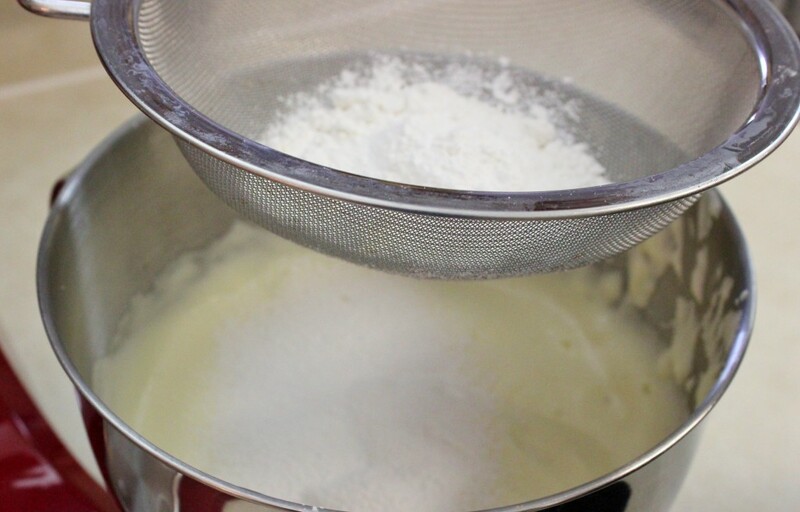 When you have about half the flour incorporated, pour the melted butter into the batter by pouring it slowly using the side of the bowl and continue gently folding. Pour into prepared baking sheet and spread out evenly. Bake for 5-7 min. Place the cake upside down on a clean kitchen towel. 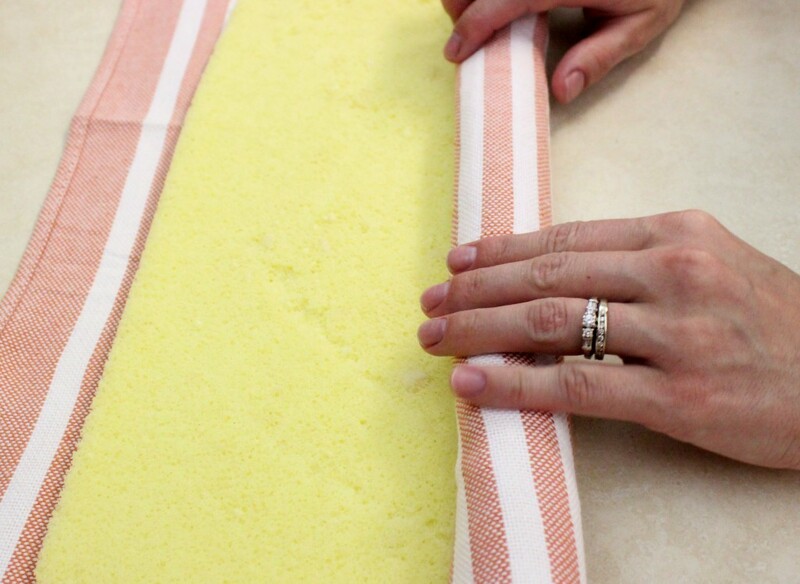 Carefully remove the parchment paper and roll the cake right up into the towel while it’s still hot. 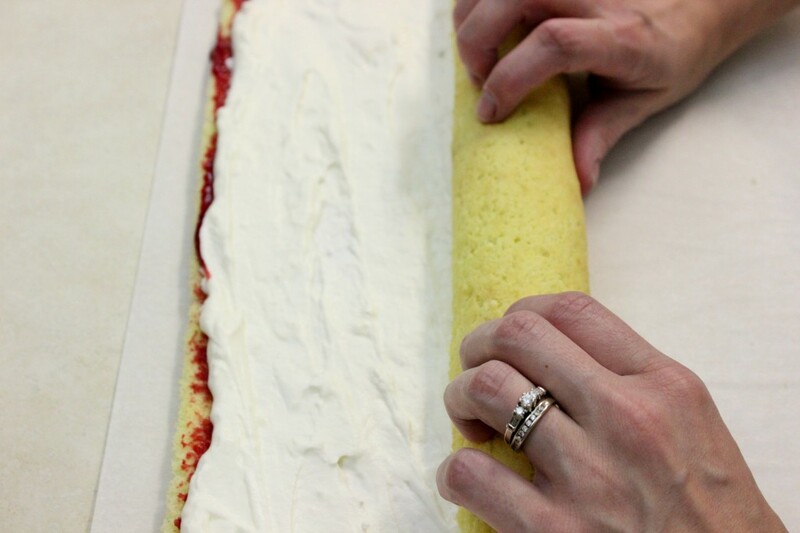 If you want the cake roll to be thicker, start rolling with the width side first. If you want the cake roll to be thinner, start with the length side. Allow to cool. 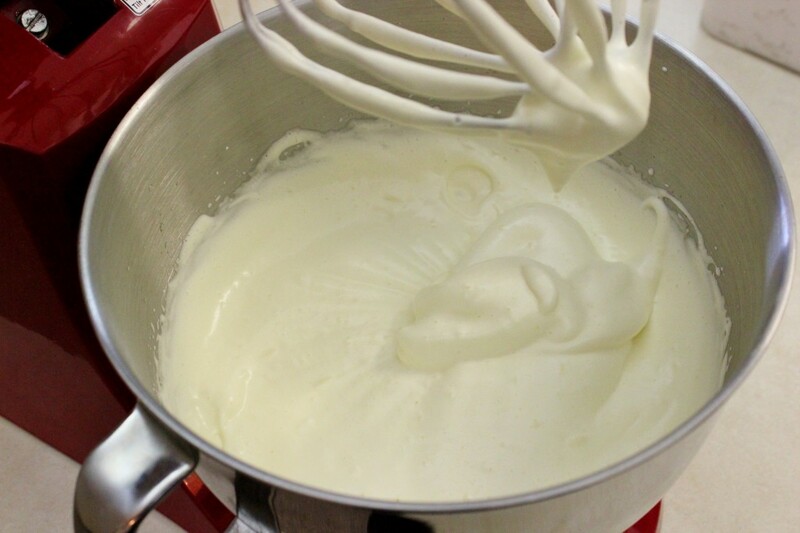 Whip the cream in a chilled bowl and chilled whisk attachment. Set aside. 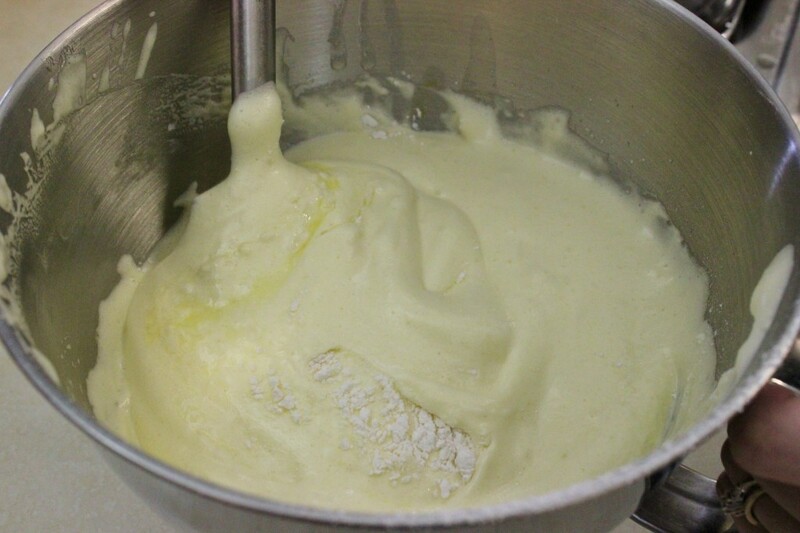 With a paddle attachment, mix the cream cheese, sugar and vanilla until smooth. 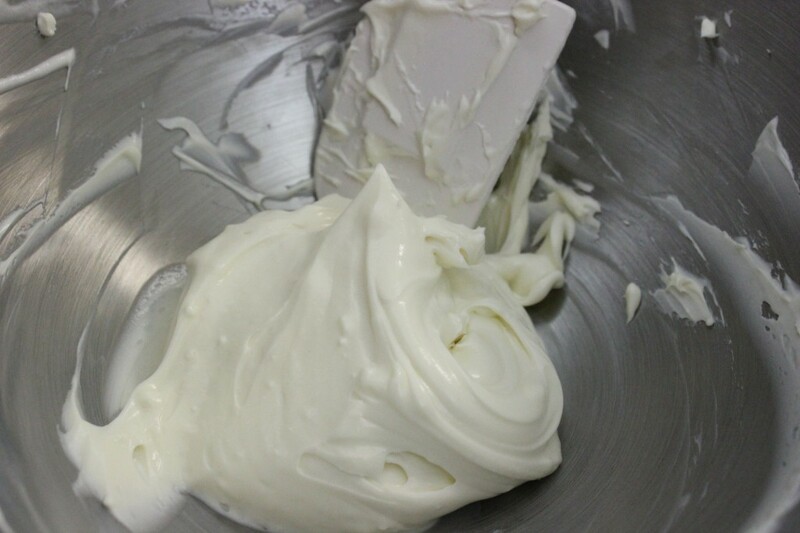 With a rubber spatula, gently fold in the whipped cream into the cream cheese mixture. 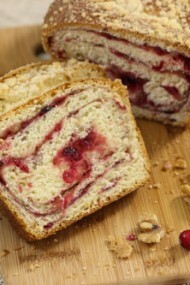 When the cake roll is cool, unroll it, and spread the jam evenly over the surface. 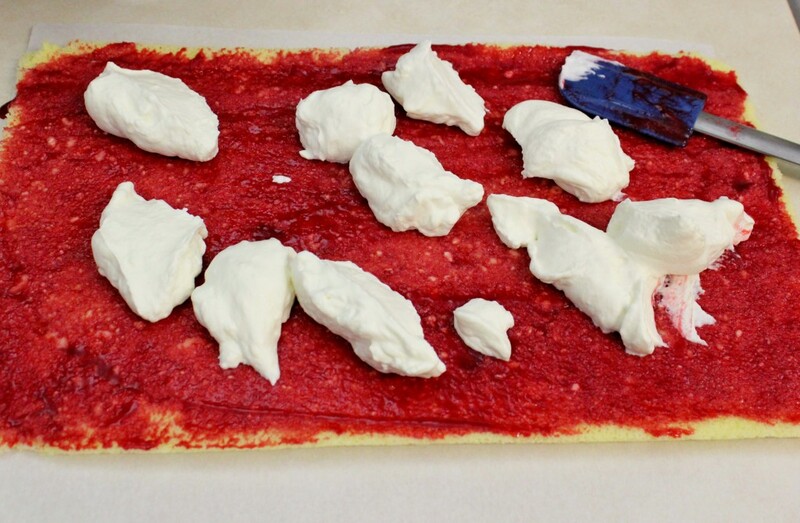 Put dollops of cream cheese frosting on top of the jam and then carefully spread it our over the jam. 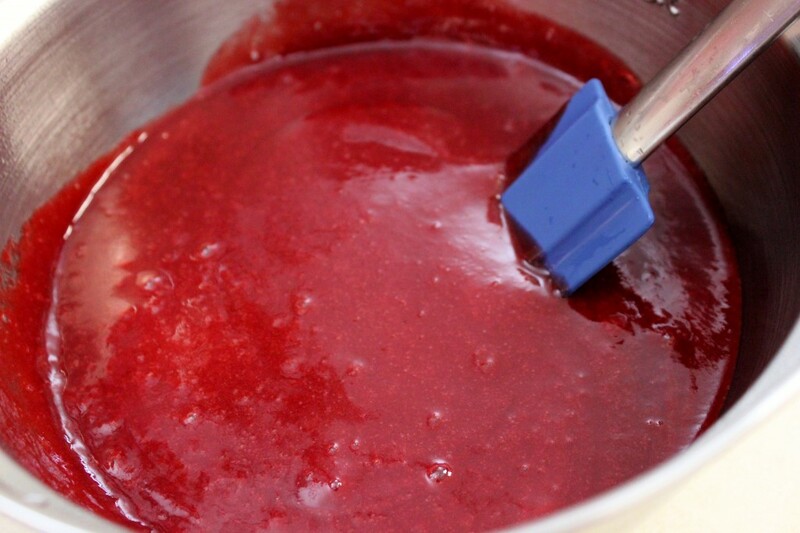 This really helps to spread the frosting neatly on top of the jam without turning it into pink smears. 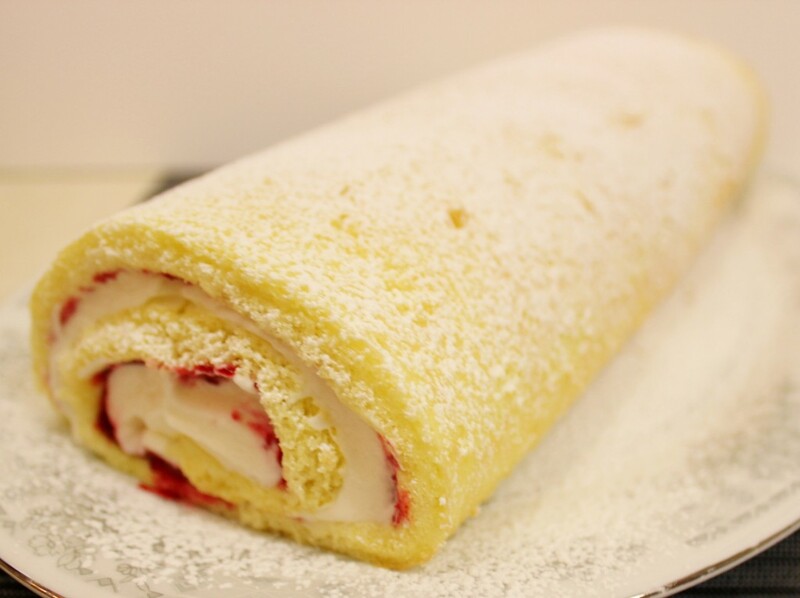 Roll up the cake roll. Dust with powdered sugar and refrigerate for at least 1 hour before serving. 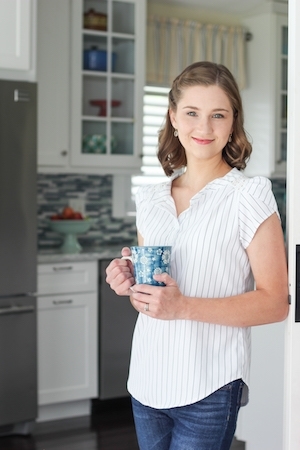 Here’s a trick to keep the jam and cream cheese frosting from streaking and smearing all over each other. When cutting the cake roll, clean the knife every time you make a cut. Wipe it on a paper towel, or something of the sort. It works like a charm:). Preheat the oven to 400 degrees. Line a 15x17 in baking sheet with parchment paper and spray with baking spray. 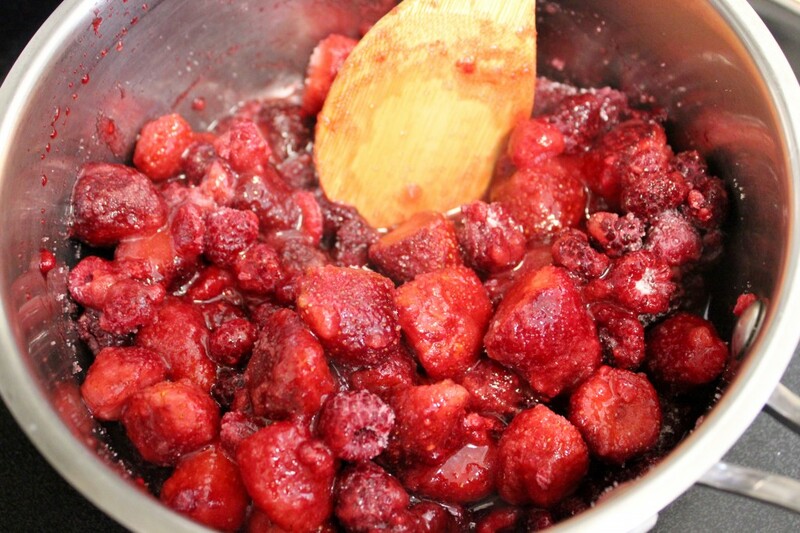 In a small sauce pan, combine the berries with the sugar. Cover and allow to cook on medium heat until the sugar melts. Bring to a boil. Turn down the heat and keep the berries simmering. Mash with a potato masher or combine in a food processor/blender. 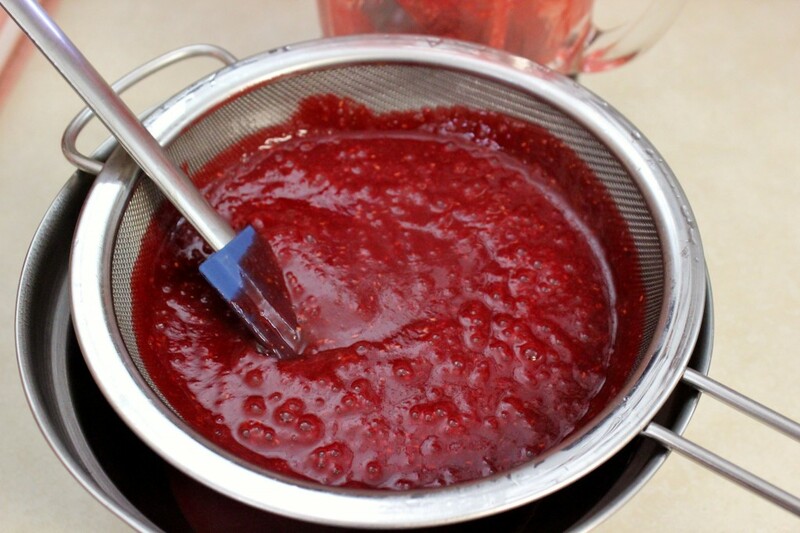 Strain the cooked berries through a fine mesh sieve to get a smooth jam. Combine the eggs and sugar in a heatproof bowl. Place over a pot with about 1-2 inches of boiling water. Whisk until the sugar dissolves and the eggs are slightly warm. Place in a large bowl and mix with a whisk attachment for about 6 min, or until the eggs are light yellow and fluffy. Sift in the flour and salt and gently fold in with a rubber spatula. When you have about half the flour incorporated,slowly pour the melted butter into the batter and continue gently folding. Pour into prepared baking sheet and spread out evenly. Place the cake upside down on a clean kitchen towel. 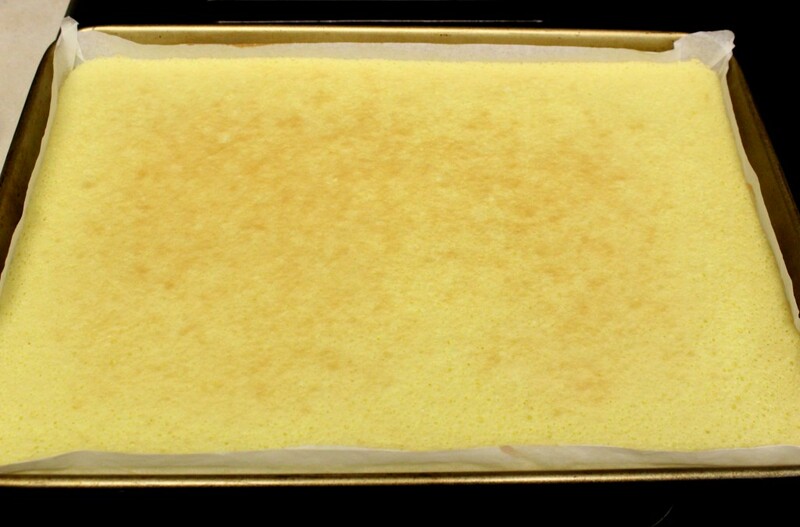 Carefully remove the parchment paper and roll the cake into the towel while it's still hot. 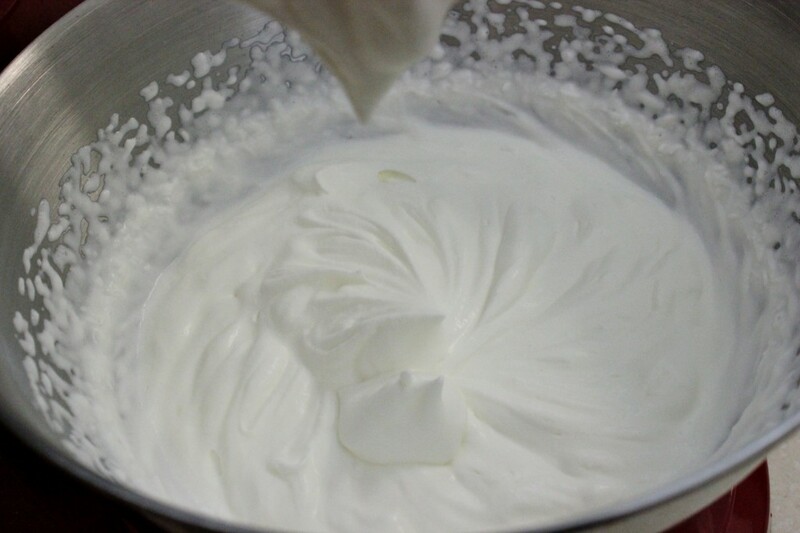 Whip the cream in a chilled bowl and chilled whisk attachment. Set aside. 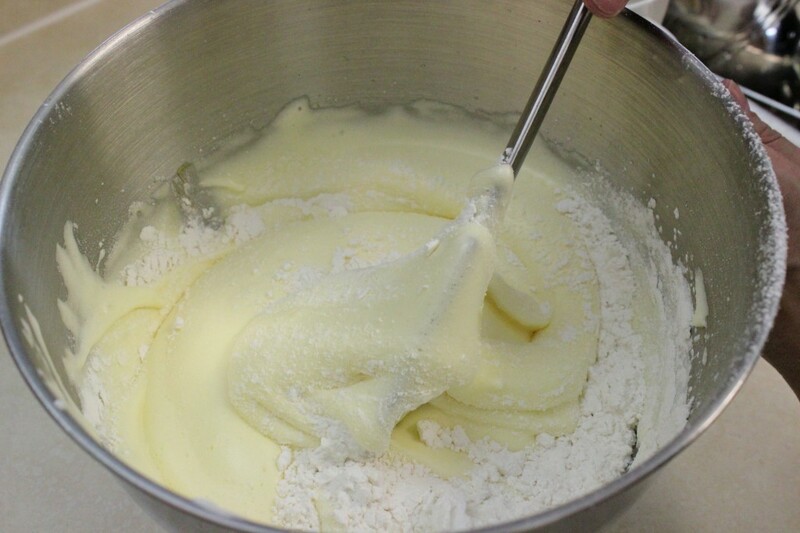 With a paddle attachment, mix the cream cheese, sugar and vanilla until smooth. 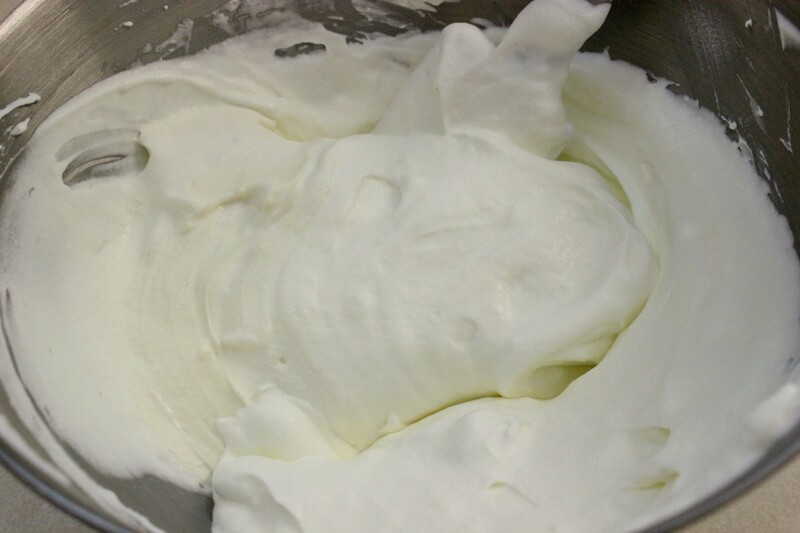 With a rubber spatula, gently fold in the whipped cream into the cream cheese mixture. 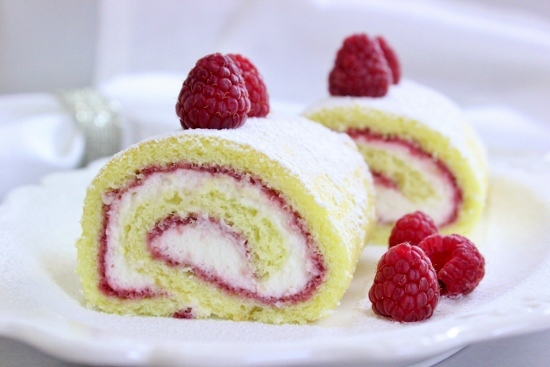 When the cake roll is cool, unroll it, and spread the jam evenly over the surface. 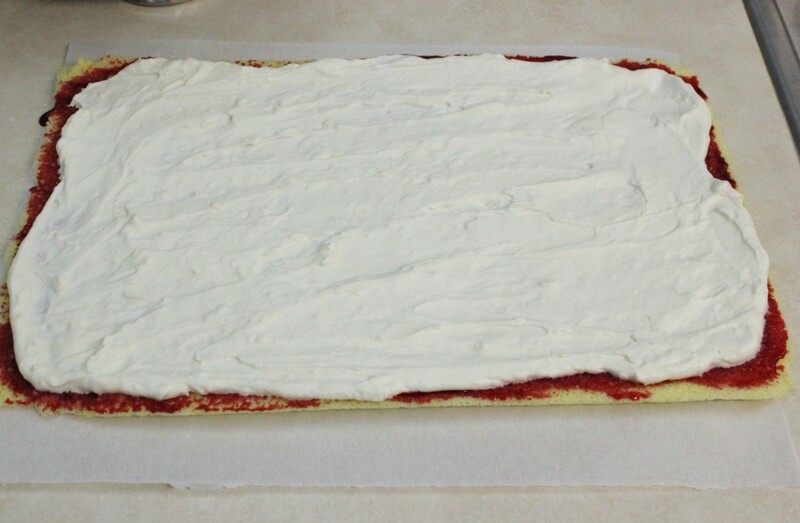 Put dollops of cream cheese frosting on top of the jam and then carefully spread it our over the jam. 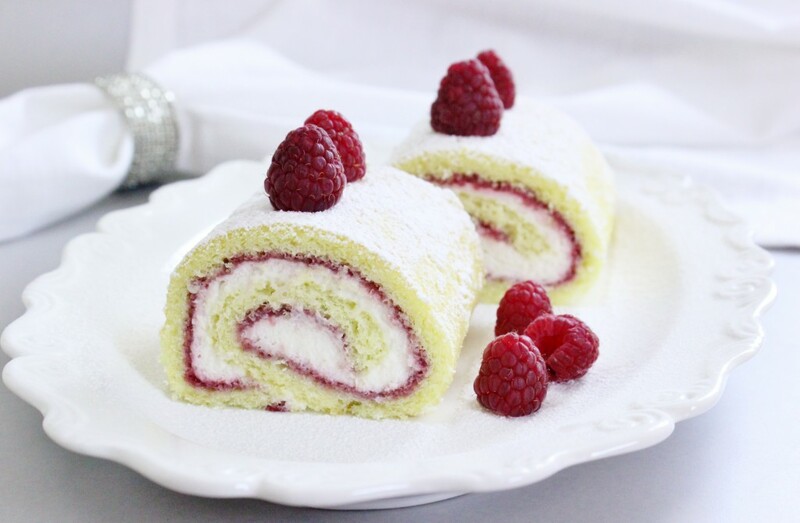 Roll up the cake roll. Dust with powdered sugar and refrigerate for at least 1 hour before serving. Olga, this was so delicious when you made it!!!!! I could eat the whole thing myself. Wow! Thank you, Natasha! I am very honored:) All those cakes look delicious. Thanks Inna! I’m glad you’re enjoying the recipes. It’s 2 extra yolks, not whites. The beaten eggs will be pale YELLOW, not white. 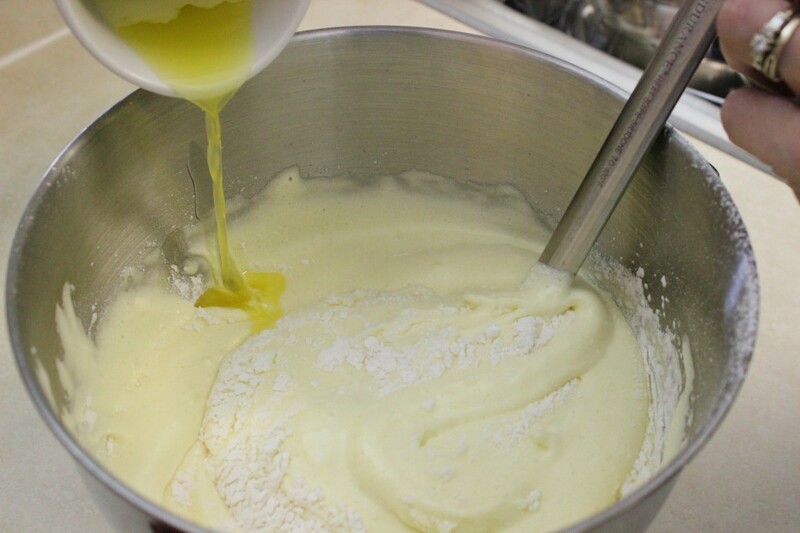 You should be mixing it for at least 5 minutes, longer if you’re using a hand mixer. Some egg yolks are brighter than others, so if it’s more yellow than mine, that’s fine, as long as the eggs have enough volume. Hi Olga! Does the biskvit part of the cake get wet from the jam? No need to worry, Nadia; the cake part doesn’t get wet:). Sorry I mean moisty:) we like when the cake is has some moisture in it. First of all, the actual cake is very tender and with the jam and cream filling, it is a very moist, light and delicate dessert. MMM this is heavenly! So light and delicious! We pretty much gulped it down 😛 making another one 🙂 Thank you Olga! Margarita, if you don’t strain the jam, you will have LOTS of seeds in it. If that’s ok with you, skip this step. Olga, you are using unsalted butter, correct? i dont bake at all but i really want to try this for my sons birthday. Im hoping it will turn out good. 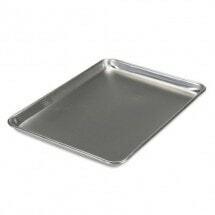 Also, any suggestions as to where i can find a 15×17 baking sheet? Yes, I always use unsalted butter, but using salted butter won’t spoil it. 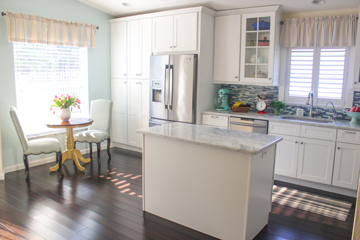 Most stores have different sizes of baking sheets. I buy most of my supplies online. Is there anything else I can use instead of cranberry? As I mentioned in the recipe, you can use any berries. I make mine with strawberries and raspberries all the time. My boyfriend hates cranberries and I was wondering if you think it would be alright to substitute the cranberries for strawberries. 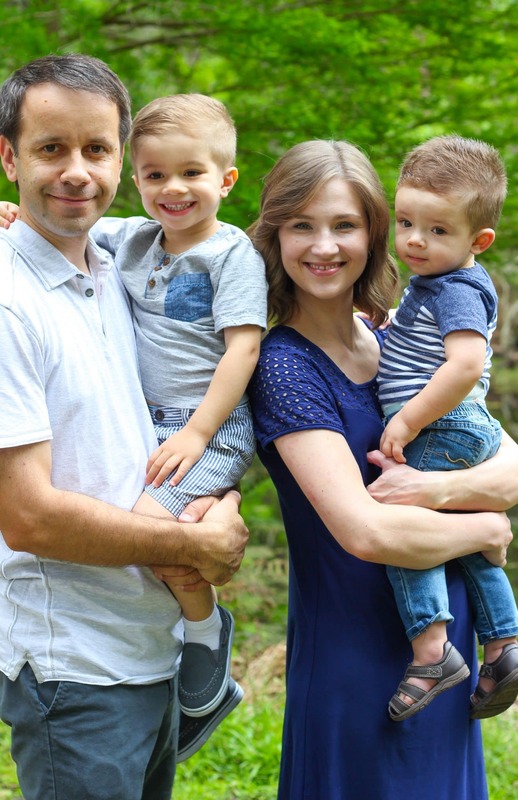 Thanks for all your delicious recipes! Yes, you can use strawberries instead of raspberries. If you read carefully, I wrote in the recipe that you can use other berries and there’s also a picture of a jam that I made with strawberries and raspberries. Cranberries are very seasonal, so when they aren’t available, I use many other kinds of fruit instead. Just a little bit more than 1/2 cup flour for an entire cake?? How can this be correct? It’s a cake roll, which is very thin, in this case, Shirley. It has a very fluffy and tender texture. 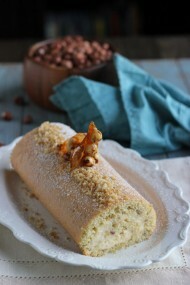 I’ve made this cake roll many, many times and it always turned out perfectly:). I hope you enjoy it. The idea of it and the photos look good, but… Just a little bit more than 1/2 cup flour for an entire cake?? How can this be correct? 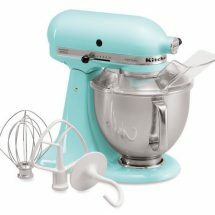 Hi, I would like to make this for Easter and was wondering if I used a hand mixer instead of a attachment ones would it come out the same?